Because St Thomas and St John are so close together, many of the St Thomas dive sites are visited by operators on both islands. 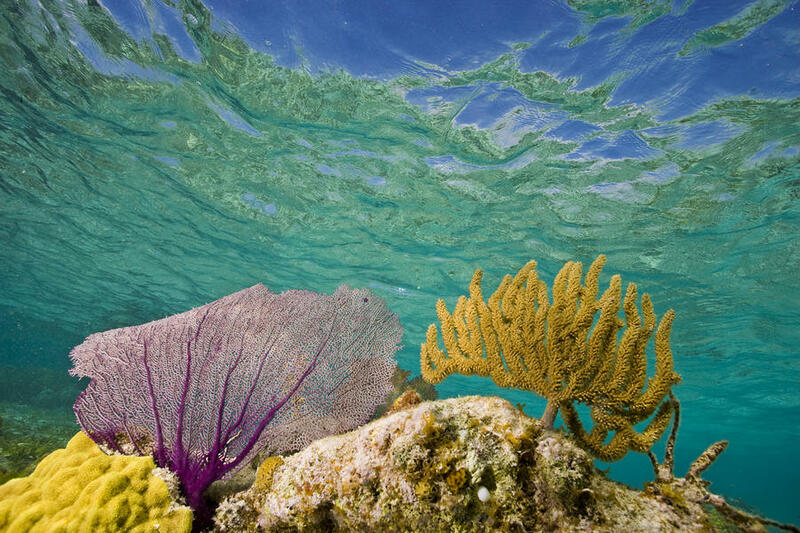 Here are some of the more popular scuba USVI dive sites reached from St Thomas and St John. On the north side of Thatch Cay, this offers excellent opportunities for beginning and experienced divers. There are fields of soft corals, sponge-encrusted canyons, and dramatic drop-offs to explore in 40 to 70 feet of water. The sea swell passing through a crevice in the rock makes a rythmic sound which has been described as a sea monster snoring! Due north of St John’s western tip, this is a USVI dive best suited to experienced divers because of the currents here. Dramatic rock formations in 20 to 80 feet of water host a wide variety of sea life including many invertebrates as well as an array of small to large fish, including sharks and occasional manta rays. A popular beach st Thomas dive sites is on the northeastern coast of St Thomas. Very clear and calm conditions make this a good location for snorkeling as well as for beach-entry scuba with no surface swim necessary. For divers, there are two reefs in 40 to 50 feet of water. Very good for beginners. Also excellent for night dives. One of the most talked about st Thomas dive sites lies Just to the west of Carval Rock. The eastern portion has currents making it best suited to experienced divers. Dramatic rock pinnacles and ridges plus lots of soft coral formations and reef fish from 25 to 80 feet deep. The southwestern portion is popular with beginners and experienced alike, and offers 30 to 60 foot depths with coral encrusted rocks and lots of reef fish, as well as some pelagic species like tarpon and Spanish mackerel. This is a popular scuba USVI dive site for introductory/resort dives and certification dives. It’s also popular with more experienced divers. Lots of canyons, ridges, and pass-through arches and tunnels. A variety of marine life including soft and hard corals, schools of jacks and spade-fish, and hawks-bill turtles are all commonly seen here. Another popular st Thomas dive sites for introductory and new certification dives. Actually four different sites ranging from 15 to 70 feet. There are impressive, brilliantly colored corals which form huge individual mounds on a sandy bottom. You can see a variety of reef fish as well as pelagic species here. Another good, sheltered site that’s popular with beginners as well as the more experienced. There are numerous ledges and overhangs with lots of brilliantly colored corals and sponges in relatively shallow water, making this a good site for snorkeling, and night diving as well. You’ll probably see large schools of yellowtail snappers, hawksbill turtles, and spotted eagle rays here. This is a popular st Thomas dive site wreck dive for experienced divers. A 300-plus foot transport which was deliberately sunk in 75 feet of water. Lots of entries and exits with good light getting inside the structure, so there’s good coral growth. There’s usually a strong current here, so it’s not for beginners. An excellent wreck dive, this is a 180 foot Coast Guard tender in 75 feet of water (rising to 40 feet). Well encrusted with corals and sponges, the wreck hosts lots of fish and other marine life. It’s also a popular night dive. Not for beginners. This site is in British Virgin Islands waters, but because of the quality of the dive it’s very popular with US Virgin Islands scuba operators. The Rhone was a 367 foot, iron-hulled sailing and steam ship that sunk in a hurricane in 1867. The wreck lies on the leeward side of Salt Cay, making for calm conditions most of the time. This is where the underwater scenes in the movie “The Deep” were filmed. Because it’s in British waters, you’ll need a passport for this dive. This amazing st Thomas dive sites Drop down on the sheltered south side of this rock formation, then kick hard against the stiff current flowing through “The Cut,” a shallow, submerged passage through the rock. Let the current take you 360 degrees around the rock, past dramatic formations and through a narrow canyon packed with baitfish and tarpon. The sheer wall on the east end drops to 80 feet, and the shallow coral gardens on the way back to the boat are good places to look for nurse sharks, reef squid and octopus. This small cay south of St. Thomas is too far for most dive boats to visit with any regularity, but when the weather is perfect, special trips do happen and they’re worth it. There are a few spots to dive here, and the Pinnacle is one you shouldn’t miss. A handful of rock spires shoot up from the 95-foot bottom to about 40 feet. Jacks and barracuda chase swarms of reef fish around the summit. Craggy fissures provide ample nooks for green morays and octopus to hide. These sister sites are easily accessible from either St. Thomas or St. John. Both feature undersea playgrounds complete with arches, canyons and swim-throughs at a max depth of 45 feet. At Cow Rock, a tunnel packed with silversides ends with “The Champagne Cork,” a vertical opening where the surge pops divers out onto the surrounding staghorn coral reef. Look for gray reef sharks cruising the perimeter. This st thomas dive site starts in a wide sand channel where large southern stingrays rest and forage for food. Follow your dive guide through a backbone of rock spires to the coral-draped wall. Dolphins sometimes cruise the sand channel surrounding the cay. Depths are between 25 and 80 feet with the best formations and marine life between 35 and 60. Tunnels of Thatch These tunnels on the north side of Thatch Cay are only safe when flat calm surface conditions keep the surge down. You’ll meander through a winding path of baitfish- and tarpon-packed canyons and caverns, then explore a sloping, boulder-strewn hillside at depths of 25 to 40 feet. Remember, this list is just a small selection of the St Thomas and St John dive sites available for you to scuba USVI. Primary Languages: English, but locals also speak a Virgin Islands creole. Cultural Influences: Danish, American, African. Topside Trinkets: Caribbean hook bracelets, Cruzan rum. Travel Savvy Tip: No passport is required to travel in “America’s Caribbean,” but bring one along if you want to take a side trip to the nearby British Virgin Islands.